Quick and Easy Meals that are Flavorful, Inspiring and with BIG Savings! Now, more than ever, today’s busy moms are looking for convenience and foods to help put quick and easy meals on the table for their families. It’s a nutrient-dense food with many of the proteins, minerals and vitamins required for a healthy balanced diet. Pork tenderloin is low in calories, fat, cholesterol and sodium. To help our consumers better navigate the supermarket, the American Heart Association’s Heart-Check mark easily identifies foods – including pork tenderloin that meets the organizations heart-healthy guidelines as part of an overall sensible eating pattern. Another great tip busy moms should keep in mind is when purchasing a whole pork loin or the larger cuts of pork, how can it save them time and money? Wouldn’t you like to know a little more about being able to purchase the right cuts of pork for the right price? Did you know that pork chops are the most frequently purchased cut? The pork loin offers several options for delicious pork recipes. Keep in mind when visiting the meat case; make sure to look for the lean cuts of pork with the word “loin” on the label, such as pork tenderloin or loin roast. Any pork chop is also a lean choice. From ribs to chops to roast, pick your favorite! Keep in mind, your best value is to pick a whole loin and slice it the way you like it or have it cut at the meat counter! There are many recipes where pork tenderloin can be used, such as alfredo, fajitas and enchiladas. Ground pork is also a great in lasagna, sloppy joes, meatballs and spaghetti! Best of all, pork can be cooked in a variety of ways from grilling, roasting, stove-top to slow-cooker! Just because you want to put quick and easy meals on the table for your busy schedules, you don’t have to compromise on taste! The USDA recently announced that pork can safely be cooked to 145 degrees, followed by a three-minute rest time, resulting in pork that is more tender, juicy and flavorful! Ground pork, like all ground meat, should be cooked to 160 degrees. Combine sugar, chili powder, salt onion powder and allspice in medium bowl. Set aside half the spice mixture (about 1/3 c). Sprinkle the rest over both sides of ribs. Pour ½ c root beer into slow cooker and add ribs. Cover and cook on low for 5-6 hours or on high for 3-4 hours, until ribs are very tender. With 10 minutes left on ribs, combine remaining root beer and reserve spice mixture and stir until sauce thickens, just a few seconds. Remove from heat; set aside. 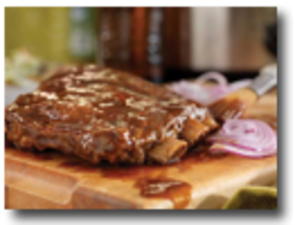 Brush ribs with sauce, serve with remaining sauce on side. You can’t beat a refreshing slaw with ribs – one with a little sweetness from apples, oranges, or raisins would be nice with this recipe. It would also be good with oven fries alongside. To make the dish your own, try using cola instead of root beer, or serve the ribs garnished with thin slivers of red onion. For more nutritional information and pork recipes or for information, please visit www.sdpork.org.